Water reed thatching is a proven system with a life expectancy in excess of 60 years. A thatched roof is sturdy, durable and an effective barrier against the elements and is impenetrable to bugs, birds and vermin. It is not only beautiful on the eye, but also environmentally beautiful. 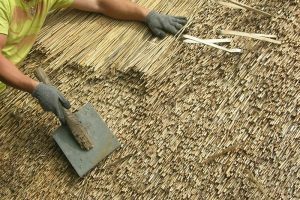 From harvest to the finished roof, thatch uses a minimal amount of energy. Once on the roof, the reed acts as a carbon store and carbon drawn from the atmosphere during the growth period is locked within the reeds. Why use thatch for a roof? Thatched roofs are beautiful! Once you’ve seen a thatched building in decent repair, you’ll never ask the question again. There is simply no other type of roof that has such texture, such swoops and rolls, and such personality. Distinctive? With a capital D! What is thatch and a thatched roof? Thatch is a natural reed and grass which, when properly cut, dried, and installed, forms a waterproof roof. Traditionally thatchers use locally available materials. If local farmers were growing wheat, then wheat reed or straw was used. Rye, barley and oat straw, and even heathers have been used. In wet lowlands, sedge has been a traditional thatch, particularly for ridging material. The most durable thatching material is water reed (Phragmites Australis) which can last up to 60 years but in Ireland 30 years is more typical. The Shannon River and its tributaries used to produce an abundance of water reed. It still does, but increased runoff of farm fertilizers in the last two decades have all but ruined this traditional source of reed. When bathed in nitrates, water reeds grow longer and faster. They become much more brittle and are easily snapped. Their useful lifespan on a roof is also shortened tremendously. How does a thatched roof keep out rain? Water reed is naturally waterproof. This is no waterlogged plant, soggy and bloated with water. In fact, the inside of a natural water reed is hollow. The water is kept out by the tight overlapping of cells on the plant’s outer layers. If you bundle enough of these water shedding plants together, water simply cannot penetrate. Moisture typically does not absorb into the thatch bundles more than 1 or 2 inches. The thatchers’ art consists of carefully laying 5 to 6 foot bundles of reeds atop one another so that an impenetrable shell of waterproofing covers a roof. Each thatch layer is built up to a minimum thickness of around 14 inches and gravity carries rain, sleet, and snow down and off the roof. What about ventilation and insulation? One of the great attractions of thatch is that is extremely thermally efficient – warm in winter and cool in summer. Unlike conventional roofing systems that trap heat and moisture vapour in attics, thatched roofs require no attic ventilation. A water reed thatched roof, 12 inches thick at a pitch angle of 45 degrees meets the most modern insulation standards. The scientific term for insulating properties is “thermal conductance,” known as the U value. The U-value of a properly thatched roof is 0.35, which is equivalent to 4 inches of fibreglass insulation between the joists. Only in the last decade have building codes begun to demand this level of roof insulation. Yet, thatch has been providing such a “modern” value for hundreds of years. An added benefit is that thatch is a much more effective sound insulation than fiberglass. An inch of thatch will stop a microphone from picking up sounds. Are there other benefits of a thatched roof? Also, organic thatch weathers to produce a warm, textured, charcoal patina over decades of service. For appearance, warmth, charm, and performance, nothing approaches thatch. Will a thatched building hold its value? Yes! Homes with thatched roofs command higher selling prices than similar ones with tile or slate. Thatch is also very effective in commercial settings such as restaurants, hotels, pubs, and retail shops. If you’re trying to tempt motorists into your commercial establishment, thatch beckons more convincingly than neon. Will thatch stand up to strong winds? Modern thatching methods make thatch one of the strongest types of roofs, certainly one better able to handle high winds than common asphalt strip shingles. Before the thatch is placed on the roof, long brass screws are firmly inserted deep into the wooden roof laths. Twisted onto the screw is a long, heavy duty steel wire. Bundles of reeds are then placed onto the roof. Over the bound reed bundles steel rods are placed. Then the wire which is secured to the lathing is tied through the reeds to the steel rods. The result is a natural water-repelling material firmly bound by steel rods and wires to the roof laths and rafters. Of course, you won’t see the steel rods or wires since these are buried 5 to 6 inches below the top reed layer. The result is a light yet extremely durable, steel tied roof. It’s not going anywhere! How is the ridge of the roof protected? There are two basic forms of ridge: flush and block. A flush ridge is just that – it is flush with the rest of the roof line and does not stand out from it. A block ridge, on the other hand, is built up and then cut to form a block raised very visibly over the roof ridge. Technically, both ridge styles are equal. Each does the job of sealing the ridge line quite effectively. The choice of which to use is usually one of aesthetics. Flush ridges are more understated. Block ridges stand out more and can be cut in quite elaborate styles. Thatchers each have their own distinctive style of ridge patterns, and experts can tell who thatched a building with a glance at the ridge line. What type of building can be thatched? Everything from small cottages to huge hotels. Houses, commercial establishments, heritage centers, holiday villages – you name it, we’ve probably thatched one. There is a practical consideration – the roof should have a slope no less than 45 degrees (12 inches in 12 inches) to aid in the shedding of water. 50 degrees is better. In high snow areas, this pitch should be considered minimum. Certain eave and dormer window designs work better with thatch than others. Thatch weighs only 7 pounds per square foot, so no special roof reinforcing is needed. Won’t pests be attracted to thatch? Rats and mice are attracted to holes. A properly thatched roof won’t have any. Rodents won’t go into properly set water reed because there’s nothing in there to interest them. Again, it should be pointed out that thin asphalt shingles are much easier for rodents to get into than 12 inches of strong water reed. If you don’t have problems with a standard roof, you won’t have them with a thatched roof. Birds are a more troublesome problem. The water reed is too well bound and heavy for the birds to pull it out. But, the wheat straw in the ridge line is quite attractive to nest building birds. There are three ways to keep this damage to a minimum. First and foremost, the ridge pattern work must be strong and effective. That’s no problem if you hire the professionals. Second, if damage appears, it must be fixed promptly. Damage or no, you’ll have to plan on replacing the roof ridge every 8 to 10 years. Finally, if birds are just a tremendous nuisance in your area, chicken mesh wiring can be laid over the roof so that no critters can get at it. When done properly, such wiring does not overly affect the look of your thatched roof. Public buildings generally require fire proofing to meet regulations. We can advise you of these requirements and provide the solutions. When thatched properly by professionals, the major portion of such a roof (the water reed) should last about 30 years in the Irish climate. However, the roof ridge will have to be replaced roughly every 8 – 10 years. Such ridge line replacement is, luckily, a fairly rapid and reasonably inexpensive procedure.